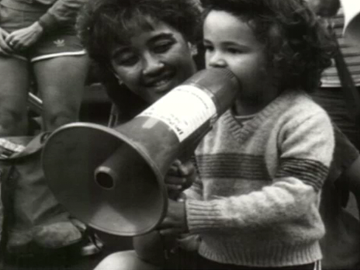 This documentary explores the 1970s/80s protest movement through six key activists and their children. Green MP Sue Bradford's daughter Katie protested with her mother at age six. Te Whenua Harawira, born during the 1978 Bastion Point occupation, led the 2004 Foreshore and Seabed hikoi. Also: Che Fu, son of Polynesian Panthers founder Tigilau Ness; Toi Iti, son of Tuhoe activist Tame Iti; and Joseph Minto, whose Dad John organised protests against the Springbok Tour. It won Best Māori Language Programme at the 2008 Qantas Film and TV Awards.